MATC uses the Rave Alert system to notify students in the event of an emergency and/or school closing. All students are automatically added to the system on a daily basis. Students are automatically removed from the Rave Alert system if they are no longer active in at least 1 class. 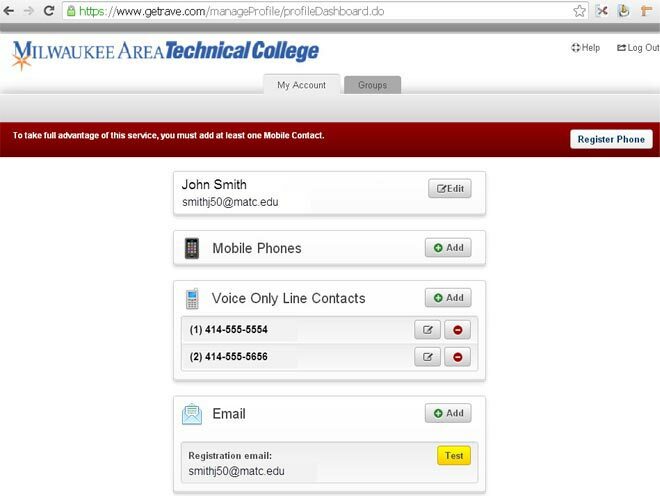 By default, we only add your official MATC email address (@gmatc.matc.edu) as a method of contact. We encourage all students to log into the Rave Alert web page and customize your preferred contact information. This can include up to three additional email addresses, SMS text message numbers,and phone numbers. The first time you login, you will be prompted with an agreement screen. Once you agree, you will see the "My Account" tab. This is where you can manage and update your contact information. Click the "Add", "Edit" or "Delete" buttons to customize your contact information.